At years end, we always take a glance back at how the past twelve months affected us. But what if you could place the most effective moments in a single room and have them all play back at the same time? At Parallax:Perspectives, we will be looking back in time but standing still in space. Maximus Clarke’s “Around the Clock”, a 3D panorama of our former home at the Clock Tower runs in a loop. Viewers may contemplate the relations between space and time and the tension between time’s linearity and its circularity — the renewal promised by each sweep of hands round the dial, each cycle of light and darkness. Jake Nelson’s live painting uses video that travels through New York City onto a blank canvas. Tracing the images for hours, the resulting canvas will be hundreds of layers of the city superimposed onto each other. Over time, the buildings and windows will become so overlaid that a sense of geographic space will be challenged. Over a dozen artists will be bringing their installations from the Parallax series on Governors Island to Flux Factory’s gallery. For one night only you can see planes of light forming a cube in fog, while dots of light fire from a sculpture and spin in space. Also, while forming a sense of psychogeography developed from a day of exploring our summer island home, Erik Sanner will be projecting Governors Island of Cones, his collaboration with Pete Emerick and Glenn Amico. Legendary 3D artist Gerald Marks will be presenting a series of images from Governors Island’s history as well as the Holocenter’s history in Nolan Park and the ClockTower of LIC. Along with a number of thoughtful and stunning projection pieces, enjoy Eternal Now: culling from dozens of hours of footage shot from the roof of the Holocenter House, Carlton Bright’s 3D video installation melds the life of Nolan Park with light painting elements. 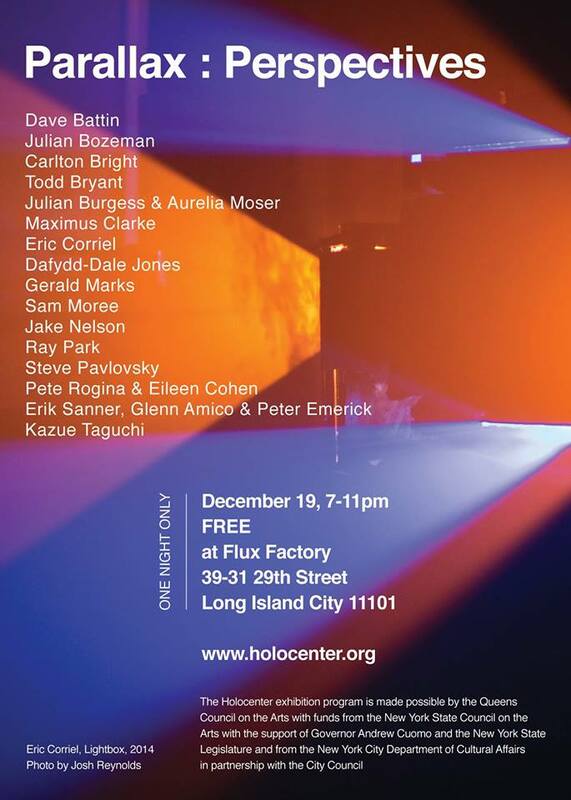 See traditional holograms, enjoy tasty refreshments, purchase affordable prints and celebrate a head-spinning 2014 while wishing us a successful 2015! Queens Buzz Read the original here.